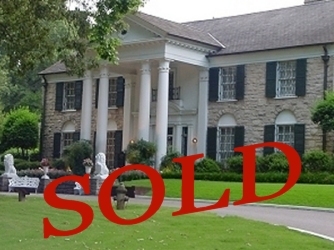 Sale of Graceland Who Really Owns Graceland? Sale of Graceland? Who Owns Graceland? GRACELAND! The most “priceless” real estate in the world. In 1979 Memphis Mayor Wyeth Chandler wanted the city of Memphis to buy Graceland his asking price for the 13 acres real estate was rumored to be US$11 million dollars. Jack Sodens business partner, who handled Lisa Marie Presleys estate for Priscilla Presley, wanted to sell Graceland in 1981. It is a good thing for Lisa Marie Presley that neither got their wish. Sodens business partner, Morgan Maxfield, died an untimely death in a private jet crash Labor Day weekend in 1981, leaving Soden to pursue his vision of opening Graceland to a hungry public. When Soden took over Graceland and began the formation of Elvis Presley Enterprises, Graceland itself had haemorrhaged money. Colonel Parkers accounting for Vernon Presley had bled the estate dry. The IRS wanted a big chunk of change from the estate, too. Fans wanted to visit Graceland, but security costs and upkeep kept the estate finances in negative territory to the tune of approximately $500,000 a year. Elvis reputation had taken a beating during the Dr. George Nichopoulous trial as well as from the tawdry details of Albert Goldmans book Elvis. Elvis world did not look so good. The next task Soden had was to corral all of the unlicensed Elvis products on the market and create a new paradigm for the intellectual property (trademark and copyrights) of a celebritys image. Soden and company did not just re-write the book on the celebrity image business; they created the rules of the industry. There is no doubt that they were the force behind the 1984 Tennessee statute regarding Protection of Personal Rights. EPE has used its war chest and lawyers to pursue the rights of Elvis image to the ends of the earth, sometimes at a major negative publicity cost. Seldom has Sodens team lost, and when they have, it has been over inconsequential financial circumstances. Their litigiousness has made hucksters reconsider illegally using the Kings image and has increased the negotiation value of the estate with any legitimate licensees. Twenty-two years later, Elvis image is restored. EPEs business is intact, running like a well-oiled machine and clearing $12 million a year in profit (a surprising figure, given the very few music rights available to EPE for Elvis biggest hits, an unfortunate Colonel Parker legacy). EPE has just negotiated a sweetheart deal for Lisa Marie Presley. Presleys new benefactor is media mogul Robert Sillerman, who made a massive fortune selling his concert company SFX to Clear Channel for over $4 billion in 2000. Presley will receive $53 million in cash; $25 million in debt assumption; and $22 million in preferred stock of Sillermans new company as well as 500,000 shares in common stock of Sillermans new company. She will still own 15% of Elvis Presley Enterprises, which Sillerman is buying. What did Presley have to give up for this treasure trove of receivables? She keeps her fathers personal effects and Graceland , which is a great PR move to appease the zealot Elvis fans as well as a physical and emotional tie to her father. She will continue to license the use of ” Graceland and these effects through EPE to Sillermans company. She merely extends the licensing capabilities from EPE to Sillermans company for worldwide promotion and exploitation. In effect she is giving the rights to Elvis image, those that EPE has accrued and has been licensing worldwide, to Sillermans new company for a huge chunk of change plus approximately 15% of Sillermans new company. If Sillerman creates a bigger licensing market for Elvis, she will profit nicely. If not, she will have received almost 8.5 times EPEs net profit per year for those rights. Although all employees of EPE are listed as remaining, were he to retire after this deal, Soden could smile, knowing that he had mastered the art of the Colonel Parker deal, getting far more than ever imaginable from the use of Elvis.